March 31, 2016 – NASA’s long-lived Mars rover Opportunity is driving to an alternative hillside target after a climb on the steepest slope ever tackled by any Mars rover. 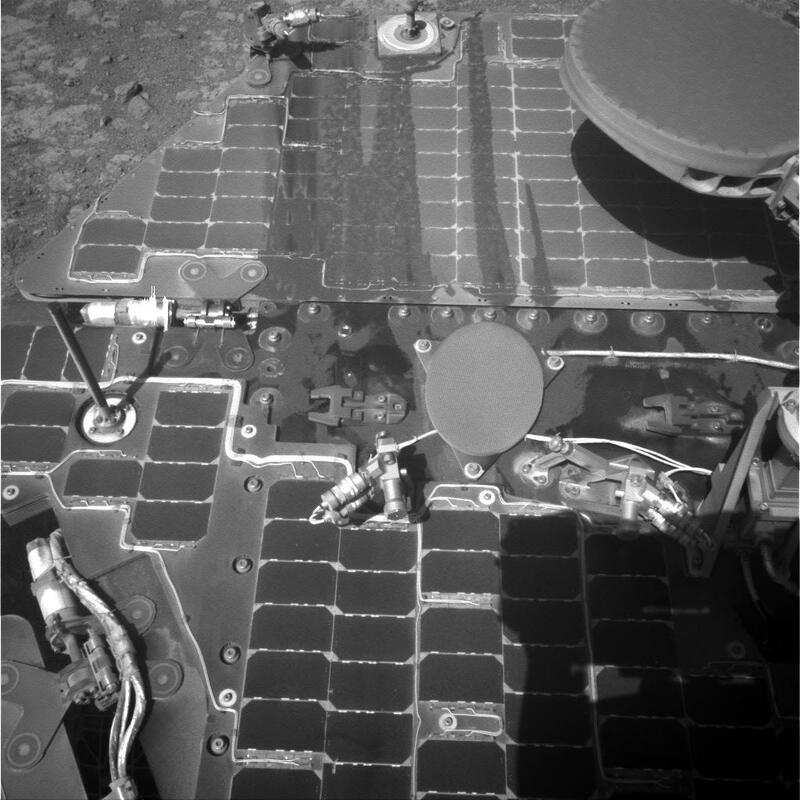 Opportunity could not quite get within reach of a target researchers hoped the rover could touch earlier this month. 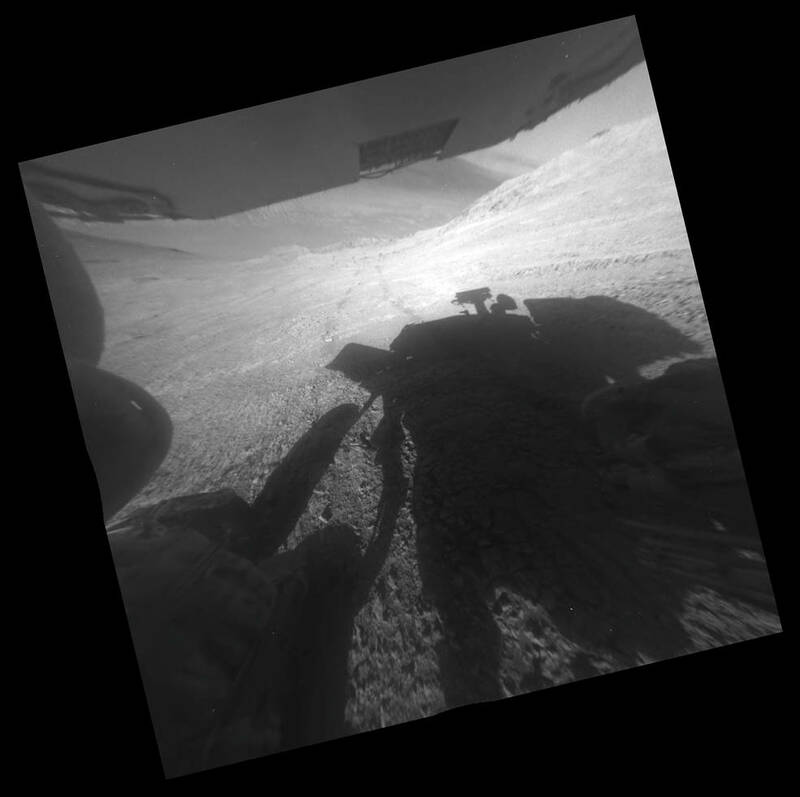 A new image shows the view overlooking the valley below and catches the rover’s own shadow and wheel tracks as Opportunity heads toward its next target. Engineers anticipated that Opportunity’s six aluminum wheels would slip quite a bit during the uphill push, so they commanded many more wheel rotations than would usually be needed to travel the intended distance. Results from the drive were received in the next relayed radio report from the rover: The wheels did turn enough to have carried the rover about 66 feet (20 meters) if there had been no slippage, but slippage was so great the vehicle progressed only about 3.5 inches (9 centimeters). This was the third attempt to reach the target and came up a few inches short. Both the intended target near the top of the ridge and the current target area farther west are on the hillside forming the southern edge of “Marathon Valley,” which slices east-west across the raised western rim of Endeavour Crater. Both targets are in areas where mineral-mapping observations by NASA’s Mars Reconnaissance Orbiter have identified clay minerals, which form in the presence of water. The March 10 drive surpassed Opportunity’s own previous record for the steepest slope ever driven by any Mars rover. That record was accomplished while Opportunity was approaching “Burns Cliff” about nine months after the mission’s January 2004 landing on Mars.